Three veteran space station fliers strapped into their Soyuz ferry craft, undocked and plunged back to Earth Sunday, making a fiery descent to a frigid pre-dawn landing in Kazakhstan to close out a 127-day stay in space. With Soyuz commander Yuri Malenchenko strapped into the descent module's center seat, flanked on the left by outgoing Expedition 33 commander Sunita Williams and on the right by Japanese astronaut Akihiko Hoshide, the crew undocked from the station's Russian Rassvet module at 5:26 p.m. EST (GMT-5) as the two spacecraft sailed 250 miles above northwestern China. Two-and-a-half hours later, positioned about 12 miles from the International Space Station, Malenchenko and Williams, acting as flight engineer, monitored a four-minute 43-second firing of the craft's braking rockets, slowing the ship by about 186 mph and kicking off an hour-long descent to Earth. After a half-hour free fall, the Soyuz TMA-05M's upper module and lower instrument and propulsion section separated and three minutes later, the manned descent module fell into the discernible atmosphere at an altitude of about 63 miles. The plunge back to Earth went smoothly, and the spacecraft's braking parachutes deployed as expected around 8:38 p.m. to slow the descent. But engineers said final events appeared to lag by a few seconds based on pre-entry predictions, resulting in a slightly off-course touchdown. Russian recovery forces, however, remained in radio contact throughout the final stages of the descent, which was carried out in pre-dawn darkness under an overcast sky with temperatures around 12 degrees Fahrenheit. 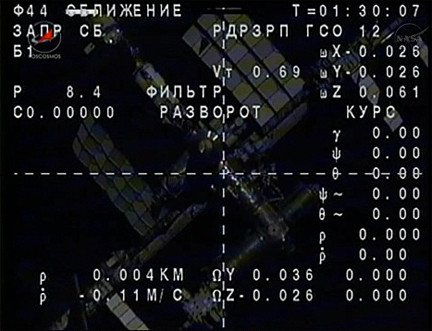 They reported touchdown at 8:56 p.m. EST (7:56 a.m. Monday local time). Recovery crews and medical personnel quickly rushed to the spacecraft, resting on its side, to help the returning crew members out of the cramped descent module as they began their readjustment to gravity after nearly four-and-a-half months in the weightlessness of space. 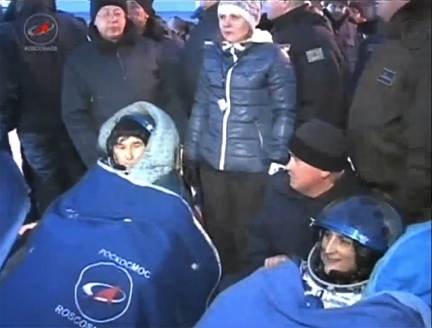 All three appeared tired but in good spirits as they rested in recliners near the descent module, bundled up in blankets as they chatted with the recovery team. The trio blasted off from the Baikonur Cosmodrome in Kazakhstan on July 15. At touchdown, Malenchenko had logged just over 641 days aloft over five flights. Hoshide's mark stood at 141 days in space during this flight and a previous shuttle mission and Williams moved up to 322 days during two flights. She now ranks second on the list of most experienced U.S. female astronauts. Following initial medical checks, the Soyuz crew was to be flown by helicopter to Kostonay, Kazakhstan. From there, Malenchenko planned to head back to Star City near Moscow while Williams and Hoshide were expected to board a NASA jet for the long flight back to Houston. During a brief change of command ceremony Saturday, Williams, a former Navy helicopter pilot, formally turned turned over responsibility for the lab complex to Kevin Ford and his crewmates, Oleg Novitskiy and Evgeny Tarelkin, who arrived at the outpost Oct. 25. "I think we've left the ship in good shape and I'm honored to hand it over to Kevin, although he's an Air Force guy and we have to make him a little more Navy because it is a ship," she said, speaking to Ford and a NASA television audience. "So I have a little present for him. This is a Navy pennant that flies over Navy ships when the commander is on board. So this is for you." During their stay aboard the station, Williams and company took delivery of two Russian Progress supply ships, a Japanese cargo vehicle and a commercial SpaceX supply craft and staged four spacewalks, one by Malenchenko and cosmonaut Gennady Padalka and three by Williams and Hoshide. Williams now ranks fifth on the list of most experienced spacewalkers with 50 hours and 40 minutes of EVA time during seven excursions. During the change-of-command ceremony, Ford thanked Williams and her crewmates for sharing their experience and helping the new crew members get up to speed on the intricacies of station operation. "Between Oleg, Evgeny and I, we have all together, if you combine all of our space time, we have about three months total time in space so far," Ford said. "And if you combine the time of Suni and Aki and Yuri, they have three years of total time living in space. So they really had a lot to offer us, we learned a tremendous amount from them and they were really, really good about sharing it. "The space station is in remarkably good condition, it's ready for full up utilization. The exercise equipment is fantastic, the facilities are fantastic, everything is in order," Ford said. "We're ready for a great expedition. We'll be here holding down the fort for maybe four or so weeks until the rest of the crew gets here and we're looking forward to doing a lot of science." Ford, Novitskiy and Tarelkin will have the space station to themselves until Dec. 21 when the Soyuz TMA-07M spacecraft docks, bringing veteran cosmonaut Roman Romanenko and shuttle veterans Thomas Marshburn and Canadian astronaut Chris Hadfield to the outpost.